The School District of New Berlin depends on the support of professionals, businesses, educational and civic organizations to provide learning experiences for our students to become college & career ready. There are many ways to get involved! Please contact anne.warchol@nbexcellence.org if you would like more information or have additional ideas. Supporting career- & service-based learning opportunities helps students build dispositions to successfully navigate the world of work and clarify their areas of interest BEFORE they invest in their post-secondary education. There is no better way for students to confirm what they like and don't like than actually doing it and/or shadowing someone who does it. 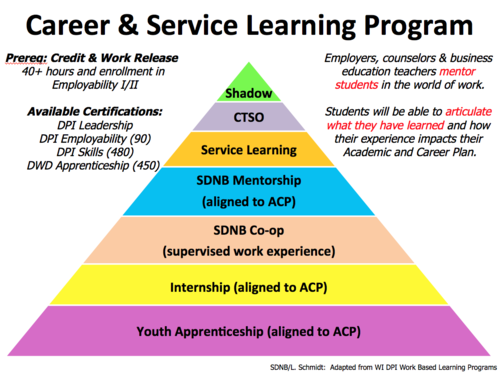 Providing career & service based learning experiences also provides an opportunity to secure qualified staff while they complete their desired post-secondary education. All learning experiences are supported by School District of New Berlin staff to ensure a mutually beneficial placement and experience. Job Shadow: Opportunity for a student to see how an organization works. Service Opportunities: Unpaid work experience and/or project based service opportunities. Mentorship: Career and post-secondary guidance from someone already working in one of the student(s) areas of interest. Co-op: Paid and supervised work experience. This is often a student's first experience in the world of work. Youth Apprenticeship: Wisconsin's nationally recognized paid internship program. Students are placed in a 1 or 2 year program and are assessed by the employer according to skills standards checklists in partnership with School District of New Berlin teaching staff. Educators are committed to life long learning. We are continually looking for professional learning opportunities to increase the relevance between what is taught in the classroom and how students will use that knowledge in their future careers. During our annual Career Days, we invite professionals to come in and give 25-minute presentations to our students on their careers. Students have had very positive feedback on these days! Our Career Days are organized in partnership with Junior Achievement. Have an idea on how you could help bring a lesson to life with a real world experience, experiment or activity? Please let us know! Thanks to past presenters. We also provide opportunities to get involved in our Summer Science and Technology Academy. Site visits provide relevance and connectivity between curriculum and the application of curriculum. The SDNB organizes a “Careers-in-Action” Industry Tour Series annually for high demand industries. Individual teachers organize additional site visits as needed to complement their curriculum. We need input from employers to make sure that our curriculum is adequately preparing students for the post-secondary education/training needed to secure good jobs in high demand industries. Program of Study Focus Group members review, advise and recommend resources in an effort to improve Academic and Career Planning in the School District of New Berlin. Would you like to get involved in one of our many organizations intended to help students build skills in business, leadership, entrepreneurship, engineering, computer science, skilled trades, etc.? We can match you to the organization that best aligns to your interests. These organizations have a variety of needs including mentorship and financial sponsorships to help pay for equipment, etc. This option is for businesses interested in supporting enrichment opportunities for students within a specific career cluster and/or scholarships for students pursuing a post-secondary education through a technical school or university. Click here for a form to sponsor a scholarship. The School District of New Berlin is committed to prioritizing those expenditures that have a positive impact on student learning. There are business and community sponsorships available for a variety of different needs every year. What it means to be "All IN." Read about recent progress, opportunities to get involved in our recent Partnership Bulletin e-newsletter! Students describe the real-world experiences they receive through SDNB&apos;s experiential learning opportunities - co-ops, youth apprenticeships, internships and more. Partners are needed to ensure our students have the knowledge, skills & dispositions to be successful in college, a career and life. Partner Willis offers students an experience to learn about the insurance industry, marketing & video production.